YOU ARE BIDDING ON A USA TRIFOLD NYLON MESH WALLER WITH EMBROIDERED USA EAGLE AND AMERICAN FLAG. IF YOU HAVE ANY QUESTIONS PLEASE ASK.THANK YOU FOR LOOKING AT OUR STORE. * ANY SHIPPING PRICE WOULD COVER ALL POSTAGE,HANDLING,DELEVERY CONFORMATION,AND ALL FEE INCURED WITH THE SALE OF THIS ITEM.INCL.ITEMS WITH FREE SHIPPING. *WE ASK THAT PAYMENTS BE MADE WITHIN 3 DAY'S OF THE END OF AUCTION. WE ARE A PROUD SELLER OF NFL MERCHANDISE LOCATED IN PENNSYLVANIA FOR FASTEST SHIPPING.CHECK OUR FEEDBACKS FOR SHIPPING SPEED!!! Looking for a way to let your BALTIMORE RAVENS pride stand out? Brighten up your after hours RAVENS tailgating party with this Team lanterns and lights set. This set includes 10 team-colored paper lanterns with the team logo and a 10' cord with lights. They are a great way to let your Eagles team spirit shine at any event! *SHIPPING WILL BE WITHIN THE USA ONLY!!! NFL Pittsburgh Steelers Domino Set in Metal Gift Tin WE HAVE MORE SETS IN STOCK.IF YOU NEED MORE THAN 3 PLEASE ASK BEFORE BIDDING.THANK YOU. Description Play the classic game of Dominoes with Rico Tag's 28 piece officially licensed set. Printed with team design on one side. Makes an attractive gift in its embossed tin. Dominoes measure approximately 2" x 1" x .375" and is a "double-six" set. FOR SALE IS A NEW YORK YANKEES ECHO BACKPACK. NEW YORK YANKEES Back to School Book Bag Backpack. This licensed kids backpack is perfect for kids for back to school. Measures approx 16x10 inches.THE BACKPACK IS CALLED A (BP ECHO) BAG BY THE MAKER.CONCEPT 1. * ANY SHIPPING PRICE WOULD COVER ALL POSTAGE,HANDLING,DELIVERY CONFORMATION,AND ALL FEE INCURED WITH THE SALE OF THIS ITEM.INCL.ITEMS WITH FREE SHIPPING. Let everyone know who you are rooting for with this licensed string of 10 lighted paper lanterns. These team logo lanterns measure 3.5 inches each and are a festive way of decorating the patio, kitchen, garage, or game room. Let your favorite team light up the party. Available in College, MLB, and NFL. Product Description PITTSBURGH STEELERS 8"DIE CUT ROUND LOGO MAGNET. *Features your team's logo screen printed with UV-protected ink for great quality. Made of heavy-gauge vinyl and clings to all metal surfaces. Item NFL Laptop Notebook Computer CASE Tote Bag Material Neoprene durable, flexible, and lightweight. Inside soft nylon and padded for computer damage resistance. Leatherette accent trim on sides and bottom. Large team logo on front. 2 Hook holders on each side for shoulder strap which is included, or to attach keys, etc. Closure 2 Zippers which go from top and down one quarter of the sides Includes Shoulder strap and carry handle Colors Black inside and out. Complete with large team logo in team colors on the front. PRODUCT DESCRIPTION; Officially licensed A watch specifically designed for the next generation of sports fans, this series features a simple and comfortable velcro strap that is sized to fit small wrists. The face of the watch features easy to read, glow-in-the-dark hands and numbers. All watches come with officially licensed color logos protected by a genuine glass crystal and rugged metal case construction. This may be a youth watch, but it still features our quality Japanese quartz accuracy and is water resistant to three ATM (99 feet). Limited lifetime warranty. 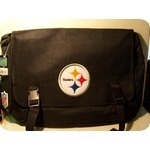 Strap length: 5.5" - 6"
For sale is the PITTSBURGH STEELERS NEW STYLE WRISTLET PURSE. The days of taking your phone out of your purse to answer a text or e-mail are over. With Charm14's new phone wallets, you can do all your texting without ever taking your phone out of the bag. WE ARE A PROUD SELLER OF NFL MERCHANDISE LACATED IN PENNSYLVANIA FOR FASTEST SHIPPING.CHECK OUR FEEDBACKS FOR SHIPPING SPEED!!! FOR SALE IS A PAIR OF DALLAS COWBOYS NFL FUZZY DICE..
FOR SALE IS A PITTSBURGH STEELERS-STEELERS AVENUE STREET SIGN. Description; THE LONG STEELERS AVE SIGN IN THE SINGLE PICTURE IS THE ITEM YOU WILL RECEIVE. There's no better way to celebrate your Pittsburgh Steelers pride! Show your team spirit proudly with this 24" X 4" AVENUE Sign. Each 24" x 4" the sign is made of durable styrene. The officially licensed Signs are decorated in the team colors, great for decorating home, office or dorm. Product Description ; How'd you like a beer bottle opener that fits right into your wallet? With a slim credit card style design, this officially licensed NFL, bottle opener is perfectly convenient and ideal for showing your team spirit. Just slip it into a designated slot in your billfold and you'll never be without a proper beer opener again. It features high-grade stainless steel construction and full color graphics. The slim design fits in your pocket or wallet easily. Never be left without a bottle opener again. Team ProMark offers innovative new licensed products from the most popular leagues and sports teams in America.